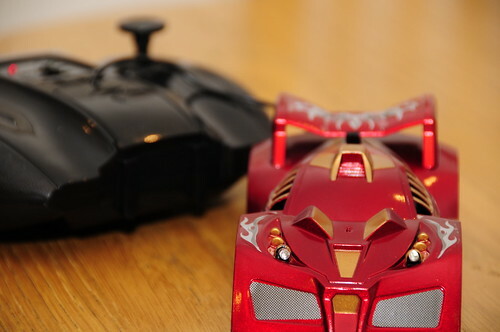 I thought I had seen everything they can do with a remote-controlled car, then I saw these. They're not well built/put-together, quite ugly and not robust enough for what they've been designed for. For a child however, none of this matters... It can drive on walls and ceilings! That's the one! Got ours from Al Ghanim in Avenues. The kids are adorable! allah ikhaleehom 7aggik!! i've seen that on TV a month or so ago, news coverage of a toy exhibit...local dealers are fast!!! and do... They would love you for 10 whole minutes! I know what you mean... We have at least 20 unused RCs! It was mate... Good fun. i need one for my dad, he'll love it! :) Have you seen the video on Facebook? Please get him one. It's a lot of fun.